Flying Object is hard to categorize. Is the organization, based in a storefront in Hadley, Mass., a publisher? An online journal? A visual arts and reading venue? An artists’ service org.? A mad scientist-like lab of invention? We’re particularly interested in collaborative and interdisciplinary work of emerging, experimental, and often overlooked artists, writers, and performers that seek to expand the traditional boundaries of a given art-form and to see that work realized through performance and/or publication. We asked Flying Object director Guy Pettit about the organization, his standard workday (or lack thereof), his community, and what makes Flying Object so hard to pin down. ArtSake: In an interview with Joshua Edwards for Poetry Society of America, you said, “We are intentionally only the approximation of a ‘non-profit arts organization. '” Can you talk about what you gain by keeping your self-identity as an organization flexible, even elusive? Guy: Well, for one, I think the mystery welcomes a wider audience. 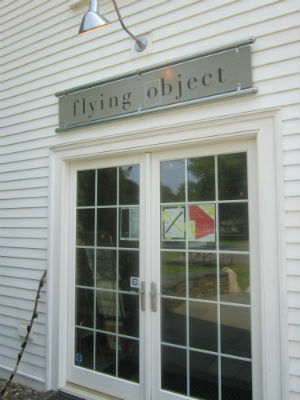 Flying Object is concerned with curiosity and discovery and I’m under the impression that allowing visitors and participants to investigate and piece together their own understanding of Flying Object gives them a certain amount of ownership, or at least, an unusual and engaging challenge. My hope is that the flexibility of the organization is influential on an individual level, or in other words, that it stirs up optimism in the power of multi-disciplinary exploration and practice to improve our lives in meaningful ways. 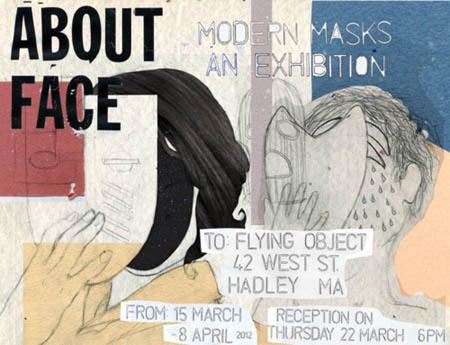 ArtSake: I assume that the multi-discipinary nature of Flying Object’s missions and programs partly reflects the interests of its principal members, but is there an aesthetic goal? What do you gain creatively by working with so many different art forms? Guy: I don’t think there is an aesthetic goal. But there is an attempt to discover, create, and support work that is innovative, intelligent, thoughtful, and perhaps a bit disobedient. I’ve found that the nature of the space – its name, the collection of books we’ve selected and make available to the public that might not be otherwise, the architecture and design of the building, the letterpress studio, the shifting appearance of the gallery – attracts people who are interested in making similar attempts. The gain from working with so many different art forms, for me, is in many ways practical and perhaps obvious. I’ve found that techniques filmmakers use can be applied to the presentation of poetry and vice versa. A book-artist might design a new form based on music packaging. Net.art, which I recently learned about, has given me some ideas for letterpress – two ostensibly disparate art forms. ArtSake: Can you take us through an average work day for Guy Pettit? Guy: That would be impossible, I’m afraid. It’s what makes working at Flying Object so thrilling. I have to do a lot of coordinating and managing, which keeps me on the computer more than I’d like, but the days are always punctuated by the excitement of producing books, or exhibits, or events. Most of all I look forward to the interactions and connections I make with the community who seek out and use the organization. ArtSake: Your storefront is located in Hadley. What appeals to you about the place you work? Guy: We’re right on a bike-path and the Connecticut River, so you can reach us by bike, boat, roller-skates or even skis when there’s snow. There’s a road, too, of course, making us just as easily reachable by car or bus. Our building (an old firehouse built in the 1860s) looks out at the gorgeous and historic Hadley common. It was the Hadley police station for some time, too. When I was cleaning it out before we opened I found evidence tags from the mid-80’s and a Department of Veteran’s Affairs issued stretcher that’s probably from the very early 20th century. It’s fun to be in such an old building and to hear all the stories from people who have a connection to it in one way or another. The community that participates in our organization has an incredible range of backgrounds and interests – book collectors, painters, musicians, poets, graphic designers and architects, book artists, doctors, gardeners, and filmmakers to name just a few. And Hadley is sort-of like neutral ground. Everyone passes through (and hopefully converges at Flying Object from time to time). A couple of the best bookstores in the country are only a few minutes down the road. The area is full of people organizing their own art collectives, organizations, and initiatives. The area has a rich literary and artistic tradition. The 5-colleges are all very close and constantly bring in really strange and brilliant people. I don’t often use this word but I think the location is really ideal. ArtSake: What does an artist need to know if he or she is interested in publishing, writing for, exhibiting with, taking a workshop at, or in some way working with Flying Object? Guy: Familiarize yourself with the space! Visit us! We like to start at a conceptual level at Flying Object. Bring us an idea first and we’ll go from there. If you’re an artist, there are 5 guest-curators for our gallery, all of whom are willing to hear proposals. We’re always booking music and readers and film screenings – but it’s important to know that we have to plan far in advance, and many of our events are produced as part of a series. Workshops and contests are announced on our website, through our email list, and on facebook. The website is actually one of the best places to start – that’s where you’ll find our address. We want to hear from you, if only just to say hello! ArtSake: What are you reading right now? What artist(s) are you excited about these days? Guy: I’ve been reading through Edward Tufte’s Beautiful Evidence and The Visual Display of Quantitative Information – two stunning books on visual information, systems, and graphics. Amanda Nadelberg’s newest collection of poetry Bright Brave Phenomenon is a current favorite of mine. As is Jacqueline Waters’s One Sleeps the Other Doesn’t. I’m in love with Forrest Bess’s paintings after getting to see them last week when I was in New York for the CUNY Chapbook Festival. I’ve also been discovering the work of Paul Chan, who publishes both print and e-books under the imprint Badlands Unlimited. ArtSake: It’s interesting the way your inclusiveness and DIY nature makes room for letterpress, traditional publishing, and gallery exhibitions on one hand, then electronic publishing and online art and writing on the other. Would it be fair to say this is just one other way you make sure you don’t close yourself off from creative possibilities? Guy: Totally fair to say. We wouldn’t want it any other way. Guy: There’s a great apartment above the gallery and bookstore that we’d love to have as a residence for a Creative Director – a fellowship position – who would oversee and guide the programming, exhibitions, and publishing we do for 1-2 years. We’re going to work really hard to try and make that a reality by next summer. That’s the dream. But as for near future, there’s a ton coming up: a talk on the history of erasure and treated books, an after-party for the UMass Juniper Literary Festival, readings, an exhibit of drawings by Joshua Vrysen, and a free workshop on letterpress for the Pioneer Valley Zine Fest, which will be held at Food for Thought Books in Amherst. And that’s only the half of it. 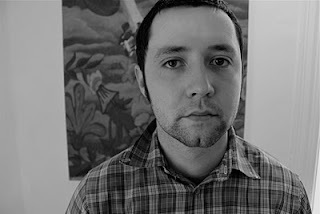 Guy Pettit is Director of Flying Object and author of the chapbook LOVE ME OR LOVE ME NO1.